T-Rex and Lizzy are at Rescue Rabbits Rock looking for a forever home. They'll make some folks a dandy pair! I mean, look at those ears - you will never be out of hearing distance - they will know what you are up to at all times! Sweet! Am I the only one to notice that T-Rex is sitting on Lizzy's head? He is trash talking potential tar pit workers, and poor, sweet Lizzy who can't hear a thing is just left wondering why she doesn't have a forever home . . . Oh, she was named after that Lizzy . . .well, in that case . . . you just keep her penned down, T-Rex. 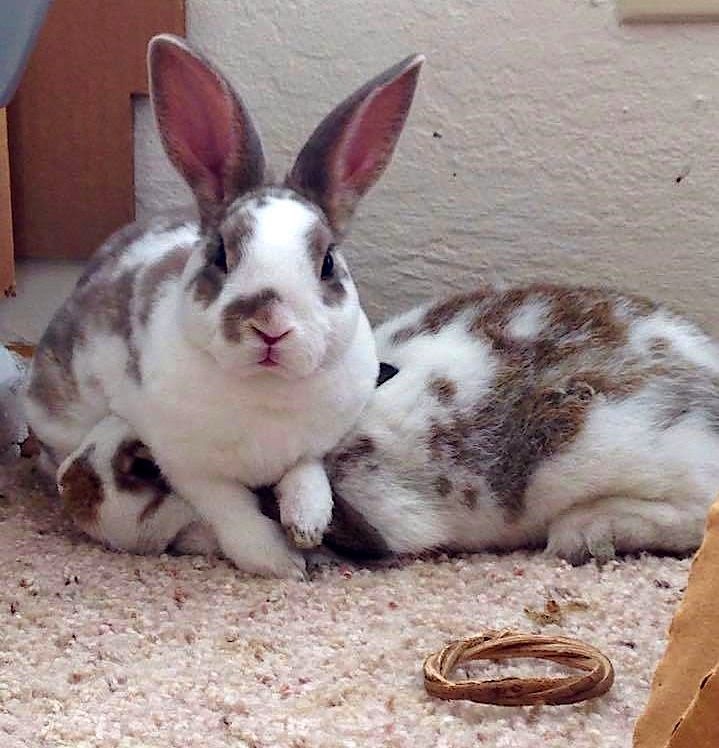 What adorable bunnies T-Rex and Lizzie are! I love how one is sitting on the other's head! You bunnehs are so cute! He is protecting her from hearing stupid things. So sweet.